Jagansnews: Who is watching you on CCTV? 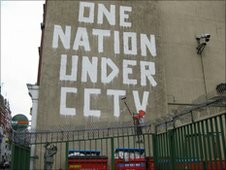 The UK is one of the heaviest users of CCTV in the world but for many shops, there is nobody to monitor the cameras so internet users are being invited to help in return for cash prizes. 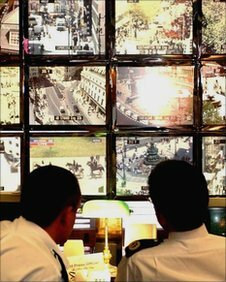 A network of CCTV cameras monitors the centre of London and, deep underground, trained professionals monitor the 120 feeds, coordinating the search for everyone from terrorists to petty thieves. But for smaller shops, monitoring CCTV can be too expensive and too labour intensive to be practical. A controversial website called Internet Eyes. invites British internet users to fill in the gaps. For £13 a year, subscribers can become part-time crime fighters. Subscribers are shown live streams of CCTV from two convenience stores somewhere in the country. If they spot something suspicious, the shop-owner can be alerted to a potential thief. If the tip-off turns out to be correct, three points are earned. And in this scheme, points mean prizes - £1,000 for the subscriber who bags the most catches in a single month. "I feel I'm contributing to public safety and crime prevention - simply by having it running in the background," says Robert Stevenson, an Internet Eyes viewer. "I could be using another application quite solidly. But out of the corner of my eye, if I see something happening I will simply click on the alert button. Within seconds the user is alerted and hey presto a crime could be prevented in real time." Shopkeeper Kamlesh Patel has been in business for 30 years and has spent much of that time trying to beat the thieves. "We have 16 cameras in the shop, which I think is not enough," says Patel. But his staff are too busy serving the customers to monitor the CCTV. "There is no way we can keep our eye on everything," he says. "In the end, we hope this scheme just stops our money and goods just walking out of our shop. It just works as another pair of eyes"
Four of his cameras are connected to the Internet Eyes service using the shop's broadband connection. When a subscriber raises the alarm, Kamlesh receives a text - giving him the chance to stop the thief in his own shop, or call the police. "Small businesses are losing a lot of gear through shoplifting and we've come up with a solution," says Tony Morgan, of Internet Eyes. "Once we've alerted the problem, the shop owner takes over and our viewers get a new screen, and that's it. So we're not being too intrusive, we're just helping him make a living." Crowdsourcing crimespotters from the web is not a new idea. Anyone in the world can watch live images from the border between Texas and Mexico and alert the authorities if they see someone attempting to cross illegally. In Texas the reward for spotting a fugitive is simple - an act of patriotism or an enhanced sense of civic duty. But the Internet Eyes scheme takes things further with the monetary reward. And that has raised alarm bells with civil liberty campaigners. After all, how many people know that popping down the shops for a pint of milk first thing in the morning could be beamed to amateur sleuths across the net? "If we're going to have so many CCTV cameras in this country then we need to be reassured that they're being operated professionally," says James Welch, legal director of Liberty. "The problem with this Internet Eyes scheme is that they're effectively setting it up as a competition - people are going to be competing to see who can get the most hits in a month - and this is bound to lead to lots of people being accosted in shops or wherever for the wrong reason. "But beyond that I think we need to be reassured that people who are monitoring CCTV cameras know what they're looking for and know their obligations under the Data Protection Act - know that they're not supposed to record stuff and pass it on, use it inappropriately." A new body of research called "video analytics" could automate the CCTV monitoring process and help reduce worries over privacy. Live images are analysed and alerts are sent to CCTV supervisors if the programme detects unusual patterns which are thought to be worth investigating. Another idea involves adding microphones to CCTV cameras to detect distressing noises like car alarms. Rather than working on volume, the software analyses pitch and tone then notifies those monitoring the images that there could be a problem. But, clever though it is, software is not yet up to making close judgement calls. For the time being, whether the surveillance is deep underground or simply assigned to an amateur somewhere on the end of an internet connection, keeping the bad guys at bay still needs a human eye.